Legat Architects walks us through what we can expect after completion of additions and renovations of our facility in 2018. [Matteson, IL] – Generations at Applewood kicked off a construction project that will enhance its already strong reputation for bringing comfort and care to its residents. Over 29,600 square feet of additions and renovations will expand services, functions, and amenities for short-term and long-term care residents. The project, designed by Legat Architects and built by Landmark Construction, features a beauty salon, an ice cream parlor with internet café, and 30 new short-term care resident rooms with private bathrooms, as well as corridor skylights that bring more natural light into the center. A new kitchen and dining area allows staff to serve the majority of residents at the same time. Additionally, the dining area gives residents views and access to a new landscaped courtyard. The project will also double the size of the physical therapy area and offer a courtyard for outdoor therapy. The majority of the addition connects the sides of the U-shaped building to create two outdoor courtyards with walking paths. 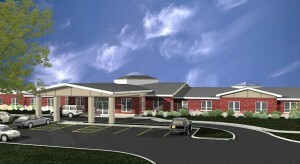 Other additions include a waiting area, library, gift shop, offices, and an entry canopy over a drop-off/pick-up lane. Renovations include nursing station modernization, resident rooms, a small dining room with a living room, offices, a beauty salon, and a new laundry services area. Legat’s interior team also selected the color palette for renovations that Generations Healthcare Network will self-perform in other parts of the facility.